William Pitt, Earl of Chatham, 1708 - 1778, Prime Minister, lived in a house on this site. Born Westminster. Died Hayes, Kent. Prime Minister. 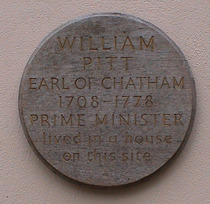 The plaque is in the entrance porch of the building.